Durable Kids Doctor Kit!! What A Deal!! 12 PIECE DOCTOR KIT:  Help children learn about the human body and calm doctor-related fears as they engage in doctor/patient role play. 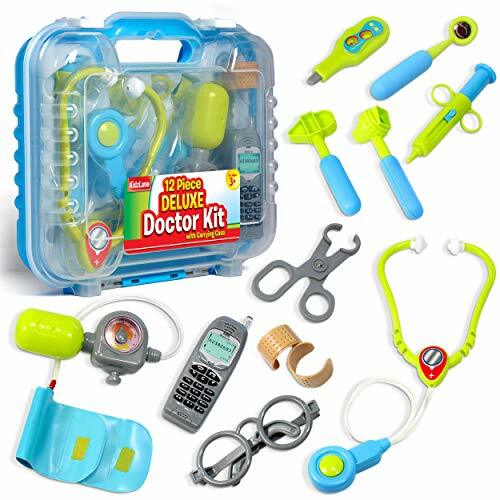 The Doctor Set has an assortment of 12 medical tools & gadgets that will spark your child's imagination! REALISTIC SOUND EFFECTS:  Bring playtime to life with entertaining sounds! The cell phone features a range of exciting tones, and the stethoscope produces an authentic real-life heartbeat and coughing sound. Batteries are included for your convenience. CARRYING CASE INCLUDED:  Time to pack away? We've got you covered with easy storage! The sturdy, spacious carrying case fits all doctor kit toys comfortably. Snap-lock latches keep the case securely closed, and are easy for children to handle. STURDY, CHILD-FRIENDLY DESIGN:  Unlike the typical shoddy toys being made today, our toys are built with quality, durability and safety in mind. The sturdy plastic instruments in this play doctor kit are easy to clean for the utmost hygiene. 100% SATISFACTION GUARANTEE:  We guarantee your complete satisfaction with this purchase, or your money back! Please contact us in case you experience any problems with your purchase, and we'll do our best to resolve any issues.